We open our inboxes to find emails with the subject lines “Visit with CTSI/CRC and CHEP,” “DARPA — Next Generation Social Science (NGS2) program — Proposer’s day,” and, mysteriously, “HIPPA: BOYD.” We suspect that this experience is all too familiar to academic psychologists and to members of any group that relies heavily on abbreviations and jargon in its communication. Abbreviations are all too common in scientific communication and are mostly unnecessary; this is reason enough for conscientious writers to avoid them. 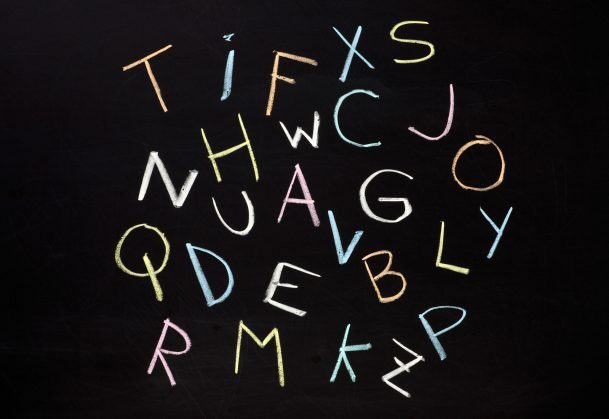 In many cases, they can confuse and alienate unfamiliar audiences, and even well-intentioned writers and speakers may overestimate an audience’s familiarity with abbreviations. Abbreviations shouldn’t be completely avoided, but using them as a default can be problematic. Mindful writers will notice that most abbreviations are unnecessary and will choose to replace them with the meaningful words that underlie them. The term acronym is often misused to refer to any arrangement of letters that stand in for full words, such as PTSD, DV, or GPS. However, words like these actually are termed initialisms. The technical definition of an acronym only encompasses abbreviations that are pronounced as words, such as POTUS, FEMA, or NAFTA. Here we will use the umbrella term abbreviation to refer to both acronyms and initialisms. syllables.1 Consider this following sentence, which is typical of something that we (social psychologists) might say to a colleague: “Did you read the new PSPB article comparing the accuracy of IATs with the AMP procedure? It is a nice follow up to the JPSP article that came out before SPSP.” This sentence is surely easier to produce than a counterpart that spells out the meaning behind each letter, and it’s most likely familiar to social psychologists, but not everyone is a social psychologist. Ingroup Identity. In his book The Upside of Irrationality, Duke University psychological scientist Dan Ariely mentions, almost in passing, that acronyms “confer a kind of secret insider knowledge; they give people a way to talk about an idea in shorthand. They increase the perceived importance of ideas, and at the same time they also help keep other ideas from entering the inner circle.” So although abbreviations can block outsiders from understanding a group’s communications, they likely provide a sense of cohesiveness to members of an ingroup. In Slang: The People’s Poetry, the historian Michael Adams treats the concept of slang as a system of language used by subcultures to build social identity and contrast themselves with the larger culture by using unique language. The same type of logic applies to abbreviations and jargon: Though they lack the informal and perhaps even stigmatized status of slang, professional abbreviations and jargon can be used, intentionally or not, to announce one’s ingroup bona fides. Mischief. 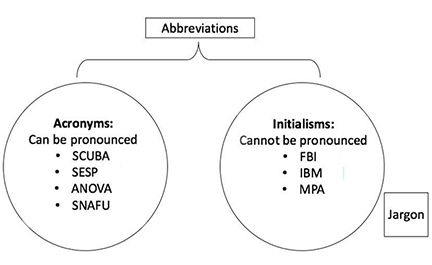 Abbreviations can be used as code, to obscure the content of a message, or to create the impression that it is especially complicated or impressive. In an editorial comment on the use of abbreviations in the Journal of Child Neurology, the late Creighton University professor Roger A. Brumback traced the origin of the term “acronym” to World War II, when it was made popular as a method of concealing a message from an enemy. Abbreviations saddle a reader with the chore of deciphering the meaning of words that could simply have been spelled out. The American Psychological Association’s publication manual (2009) is also clear: “To maximize clarity, use abbreviations sparingly” (p. 106). The manual’s phrasing is reminiscent of the Food Guide Pyramid, which instructs us to consume fats, oils, and sweets “sparingly.” The parallel is fitting: Just as fats, oils, and sweets provide very little in the way of actual nutrition, so too do abbreviations provide very little in the way of actual information. Pinker’s DA, DN, SA, and SN are without meaning. Instead, the actual meaning must be retrieved from wherever it was first identified (assuming a definition appears at least once) or from the reader’s mind (assuming they happen to be in on the jargon). This situation can be avoided by simply defaulting to the spelled-out versions of phrases. One might think, “Okay, unfamiliar abbreviations are difficult for audiences to digest. I will limit myself to using only abbreviations that are familiar to others.” This is an understandable thought, but we advise caution in letting yourself believe that a given phrase is sufficiently familiar to abbreviate. The difficulty is that people are subject to the curse of knowledge: it is hard, if not impossible, to imagine what it is like to not know something. A writer is likely to overestimate both the number of audience members who are even somewhat familiar with the abbreviation, and also the overall degree of familiarity for those who have even heard of it. This applies to abbreviations that already exist, and it applies especially to abbreviations that are christened by an author for a single work. Very subtle reminders that one is an outsider can be sufficient to trigger feelings of ostracism. Findings from a 2010 study led by Simon Fraser University social psychologist Michael T. Schmitt provide an example. Schmitt and colleagues found that when non-Christian participants were exposed to a Christmas display, they reported reduced feelings of inclusion, which in turn predicted reduced self-esteem. Similarly, a study in the University of Massachusetts Amherst lab of APS Fellow Nilanjana Dasgupta showed that when women read a job ad that described the position with gender-exclusive language (e.g., “We usually know a good employee when we see him”), they reported reductions in feelings of belonging, self-esteem, control, and meaningful existence and were less interested in pursuing the job. Expecting that unfamiliar acronyms would have similar effects, we recently tested this idea in an experiment during which we randomly assigned 98 college students to read variations of a recruitment message from CrossFit, a fitness organization known for using many abbreviations. In a control condition, the passage spelled out all abbreviations on every mention. In an abbreviations with clarification condition, the passage used abbreviations but clarified their meaning on the first mention only. In a final abbreviations without clarification condition, the passage used abbreviations with no clarifications, even on first use. Participants reported their levels of basic psychological needs (belonging, self-esteem, control, and meaningful existence), their interest in joining the group, and their sense of how difficult the passage was to read. The results were clear: As the passage became less clear, participants reported not only more threat to their basic needs, but also more difficulty reading the passage and less interest in joining the group. Scientific writing is technical and can be difficult to read and interpret even for seasoned veterans. Why make matters worse by collapsing meaningful words into abbreviations? The solution is simple: Spell out abbreviations on each use. True, abbreviations for such phrases as analysis of variance, automatic teller machine, and implicit association test are so widely used and recognized that they effectively become words themselves. However, while it may sound extreme at first, the world would not end if we replaced even ANOVA with analysis of variance. In many research reports, the term is used only a few times, and it may not hurt readers to be reminded that the analysis is doing just that: making sense of patterns of variance. Similarly, other acronyms that are highly familiar to the writer may only appear a few times in a piece, and the work is hardly compromised by spelling them out. More to the point, however, we acknowledge that some abbreviations, to some audiences, are processed as efficiently as the spelled-out words, whereas other abbreviations are unfamiliar, burdensome, and alienating. The difficulty is in anticipating the reader’s level of knowledge and accurately guessing whether they will be familiar with the terms. Writers would be well-advised to strongly distrust their own intuitions about how familiar their audience is with the abbreviations (or indeed how narrow their audience may become when the abbreviations are used). Writers avoid this dilemma when instead they default to fully written-out phrases. In some cases, it may be appropriate to use an abbreviated form of a phrase, but this should be the exception, not the default, and should only be done when the communicator has evidence that the abbreviation will be understood and processed fluently. Adams, M. (2009). Slang: The people’s poetry. Oxford, UK: Oxford University Press. Ariely, D. (2009). Predictably irrational: The hidden forces that shape our decisions. London, United Kingdom: Harper. Dodd, J. S. (1986). The ACS style guide: A manual for authors and editors. Washington, DC: American Chemical Society. Heath, C., & Heath, D. (2007). Made to stick: Why some ideas survive and others die. New York, NY: Random House. Kail, R. V. (2015). 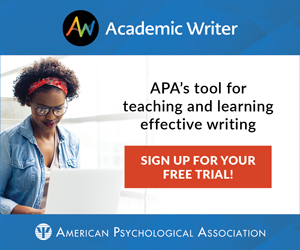 Scientific writing for psychology. Thousand Oaks, CA: SAGE. Sternberg, R. J., & Sternberg, K. (2010). The psychologist’s companion: A guide to scientific writing for students and researchers. Cambridge, United Kingdom: Cambridge University Press. Strunk, W., & White, E. B. (1959). The elements of style (2nd ed.). New York, NY: Macmillan. Pinker, S. (2014). The sense of style: The thinking person’s guide to writing in the 21st century. New York, NY: Penguin Group. Williams, K. D. (2009). Ostracism: Effects of being excluded and ignored. In M. P. Zanna (Ed. ), Advances in Experimental Social Psychology, 41, 275–314. New York, NY: Academic Press. Andrew H. Hales is a graduate student at Purdue University studying social psychological science. His research examines ostracism and social influence. Hales can be contacted via ahales@purdue.edu. APS Fellow Kipling D. Williams is a Professor of Psychological Science at Purdue University. He studies group processing and social influence with primary interests in ostracism, social loafing, stealing thunder, and Internet research. His lab developed the popular research game Cyberball to study ostracism. Williams can be contacted via kip@psych.purdue.edu. Joel Rector can be contacted via apsobserver@psychologicalscience.org.